Otherwise entitled: The Great Debate. This past Christmas season I kept hearing all about the Canon Selphy printer. It seemed like everywhere I turned, there was someone raving about how much they loved it. I did some more research, saw that it was reasonably priced, and thought, Why not? I got that tiny little bundle of joy, set it up with my iPhone and printed my first photo. Oooooh, ahhhh. It wasn’t until then that I realized that it wasn’t a true 4×6 photo. So I thought about Plan B. All this stuff is a write off (cheesy grin here) and Jordan was leaving for Florida, so wouldn’t this be a great thing to send with her–tiny and portable–and I’ll get the Epson PictureMate Charm instead? Granted, I didn’t just jump into it lightly. My cute little friend Cathy Zielske had just gotten herself one as well. She told me all about it and I decided, Okay, this baby is coming to my house too. I’ve had it for a few weeks now. And well, I’d like you to meet my new BFF. I have printed more photos in the past few weeks than I probably did all last year. It’s so convenient. It’s so fast. It’s so brilliant. Love that I can print directly from my phone. Great for parties or with friends! Teenagers would love it! There’s an app for it for your phone. Not hard to use. Don’t like that it’s not true 4×6. Don’t like that the paper tray sticks out the way it does. Gets dusty. Don’t like that it prints each CMYK one pass at a time–prints Cyan, slides back in, prints, Magenta, slides back in, etc. Compact, but a little bigger/bulkier than the Selphy. Love that it folds up to keep the dust out! Don’t like that it’s not a wi-fi already, in this day and age. But you can purchase a bluetooth adapter. Prints a pretty awesome photo. Prints all CMYK at one time. Because you’re probably printing from something like Photoshop, you’ll have greater control over anything that’s cropped. You get to decide. Costs about $100 more than the Selphy. And in case you were wondering about print samples, here’s a side by side comparison of the complete printouts. Granted, this is a picture of pictures, but work with me here. This is the exact same photo printed on both machines. As you can see here, the Selphy on the left has perforated edges that you can remove. The Selphy’s printout isn’t quite as rich as the PictureMate. I found the PictureMate to be a little sharper and deeper in color. The Selphy still looks pretty good, but the PictureMate is just a little bit better in my opinion. 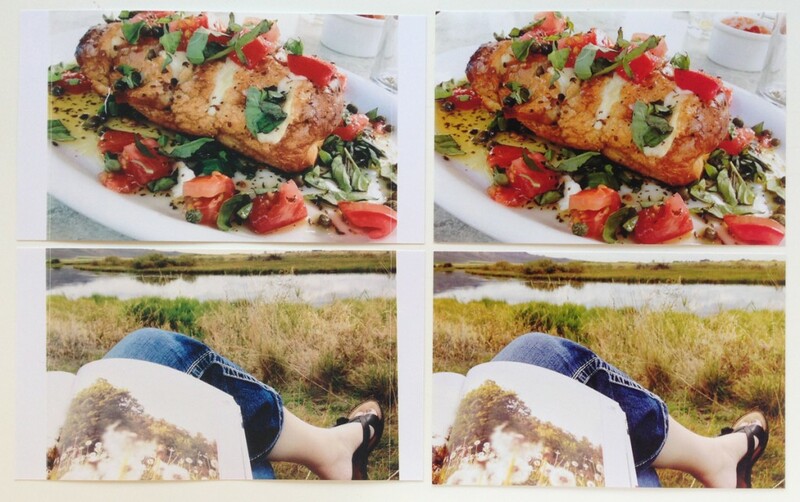 And notice that the Canon photos on the left are slightly smaller than the Epson photos on the right. I’m still just shaking my head over that fact. 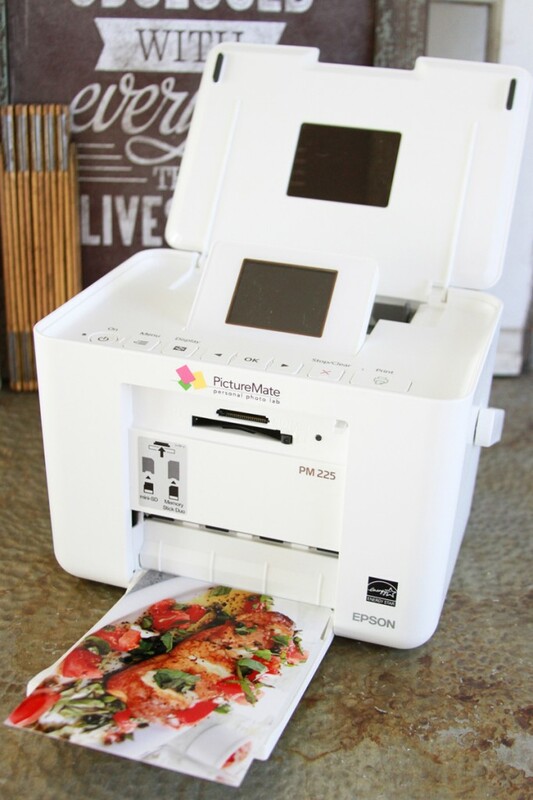 I really can’t say enough great things about the Epson PictureMate Charm printer. I’ve used it so many times because it’s so convenient and gives such great results! No more chopping letter-size photo paper. No more having to clean my print heads on my big mama Epson printer because the Yellow keeps getting dirty. It’s portable. It’s simple. Just this weekend I printed those brush script photos for Jordan and Kass printed a photo of her and her cousin and they looked great! A couple weeks before that I needed to print a couple photos for a bridal shower and voila! Done. Loved it! And Kass, who’s become a printing snob–being the photo major that she is–was quite impressed with its color. Thanks for doing this test. I have been thinking about getting the Epson. I have the Epson Artistic 710 for regular everyday use and don’t want to use it for printing pictures because the ink is so expensive. I wanted just a small printer to print as I go and not have to rely on an outside source. This is good information for my future purchase….thanks! If you purchase the Bluetooth adapter, you will love it even more. I checked out the Epson and see that you can print two wallets. Can you use the borderless function and print two 3×4 per page to use for Project Life? Thanks! I have long preferred Epson over Canon. I have owned both and was disappointed immediately with the Canon printer’s color quality. I would have to make adjustments in Photoshop before printing and it quickly became very painstaking. Too much time invested! In attending many workshops given by professional photographers, it was settled once-and-for-all in my mind when hearing them all tout Epson for print quality even though they shot with Canon cameras. That said a lot. No more questions for this girl. I have an older version of the Epson one you bought and I love it. The colors are always vibrant and it is so easy to use. I agree, they need to make it so you can use with Wifi, otherwise I have no complaints! Thanks Kerri! I’ve been wanting to get a charm for a while i’ve seen similar reviews but never side by side so this is awesome. It looks like the Pictureshare app might work to print from your phone. Don’t quote me on that just saw that in a quick google search. Darn it — I wanted to NOT want a compact photo printer! 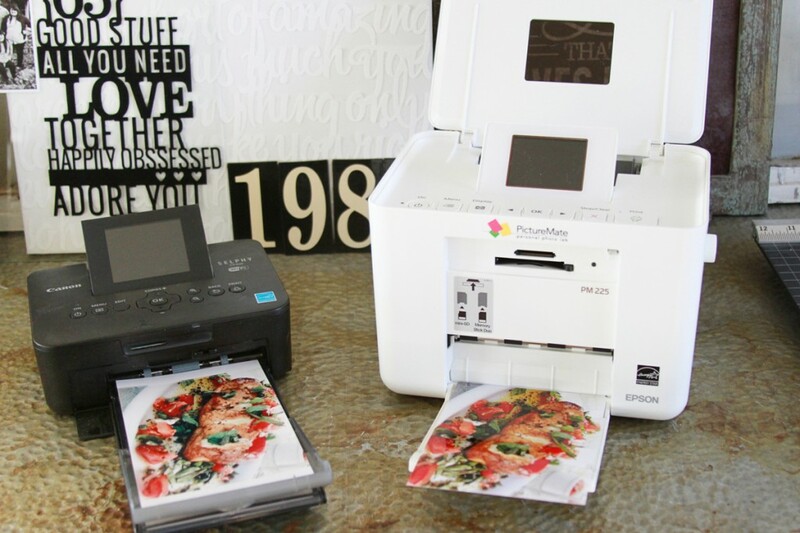 I love my Epson Stylus Photo printer (Big Mama printer). For what it’s worth, I’d choose an Epson printer for photos every time. I’m with you –what’s up with the weird size? I bought a charm after I was a little disappointed by Santa. I LOVE it too. It has really changed my flow. Pretty awesome! Ok everyone got me very interested… How is the photo paper? I have seen @ home photo paper can be Crappy. You are bang on! I have had my Picturemate for a year and it makes me happy every time I use it! I have the same printer & I love it, but mine does cut off the edges a bit. I just know that & try to avoid anything at the edge of the photo. P.S. The best place for the ink + paper (that I’ve found) is Amazon. The package is T5846 the ink + 150 sheets of photo paper is $36.29 w/free shipping. It’s typical of many printers that print borderless that the photo will expand, even if it’s only a tiny fraction, to ensure that the photo goes edge to edge. Make sure in your Print Settings that Expansion is set to Minimum when using the Borderless setting. This even occurs with regular ol’ print places like Costco or Persnickety. Rosemary, the photo paper is great. In fact, my Photo major daughter was talking about how she wanted to print something for a class at home because the paper was similar to what they used at the school, which they print photos for portfolios, so it’s really good. I’ve always been huge Epson printer fan, particularly for photos. Like, I’ve had one for years–well the R300 and then the Photo Stylus 1400. They just don’t disappoint. Marie, we’ll have to keep an eye out for the Bluetooth options. Don’t give up on the printer for the Bluetooth factor just yet because it’s an awesome printer. And Linda, I am a Canon camera person and an Epson printer person. I can totally relate! Okay… I may just have to unlike you on Facebook and stop following your blog! LOL. You make me want all these wonderful toys!!! I’m now the proud owner of a Silhouette Cameo and now I want an Epson printer! It’s a good thing all these things are necessities or else I really would unlike you. Thanks so much for the post and comparison. The “little” printer is now on my wish list. Hmmm… maybe for Mother’s Day. THANK YOU!! I have so needed this comparison. Excellent job & you’ve finally made up my mind for me. I am getting that PictureMate Charm as soon as possible lol. I’m on my second Picturemate (I had the original and now I have the Dash) and I absolutely love its versatility and the quality of the photos. What I do not love is how fast it goes through the ink! And I don’t like that you have to buy an entire print pack when all you need is the ink. I always run out of ink long before I run out of paper – I already have enough paper to last for years. Epson will refund you part of the purchase price for unused paper, but you have to keep really good records and the original packaging to send back to them and I’m not so good at that. Having said that, I’m pretty sure I’ll keep using PictureMate/Epson products because you just can’t beat the quality of the photos. could you tell me what would be the best bluetooth device to use with the Picturemate printer? I just got mine as an early birthday present on Sunday and I’d love to be able to have it bluetooth if possible. Just an FYI unless someone else has figured it out. There is no software for Windows 8. The disc doesn’t work and the Canon website doesn’t have it there either. :( (RE: Canon Selphy) Wish I’d seen this first. I have seen that comment in a few places, but I just barely went from the starter pack that comes with it to the new pack that I bought. I’d actually switched to the new pack of paper for a handful of sheets and was still using the starter ink. I left the cartridge in until it told me I absolutely had to change it. It tells you that you should change it, but the pictures still looked great up until I had to change it. I also saw that if you keep your box/upc and maybe the receipt too that Epson will supply you with another ink if you contact them with this info. So that’s always good. Why they don’t sell the two separately is just silly. Thank you so much,KERRI!Your reply is very helpful. I finally decided to buy selphy CP910. Because it sounds to be more consistent image quality. I think Epson’s marketing strategy has some unkind and silly which is I hate. I too have been comparing the Sephy to the PictureMate and had decided to buy the PictureMate because: 1) Selphy’s print resolution is only up to 300 x 300 dpi and the Picturemate resolution is 5700 x 1440 dpi, 2) the Selphy’s 4 x 6 is actually 3.94 X 5.83. Not sure if you’re familiar with dye sublimation (Canon Selphy CP-910), but a 300dpi image on a Dye Sublimation Printer is equal to 4800dpi on an Inkjet Printer (Epson PictureMate Charm). A 400dpi image is equal to 6400dpi on an Inkjet Printer. It takes a tad longer to print, but it prints out a pretty impressive photo. Wow! I did not know that…that’s good info to have here! I didn’t really pay attention to either machine’s DPI printing specs to be honest–just looking at the photos, so all that’s good stuff. And that would make sense as to why the Canon still looks like a good photo regardless of what it says the dpi is–and in comparison with the Epson. Additionally, I printed a picture on one of my better color printers, then tried to replicate it on the Canon Selphy. By turning “Image Optimize” to “Off” and changing “My Colors” to “Vivid”, I was able to pretty much accomplish this. My only quibble with the Selphy is I wish the photo paper was a standard 4×6, instead of 3.94″ x 5.83″. My main reason for purchasing the CP910 is the direct access point. It’s pretty cool to be at a party without wi-fi and still print wirelessly to the printer with it’s own built-in wi-fi access point. Plus, it’s small enough to pack and travel! I totally agree on the direct access! That’s what I love about the Canon too. Bugged by the weird size though. I probably wouldn’t have even thought about getting an Epson had the Canon printed true 4×6. More great tips too. Thanks! Thanks for the great info! Do either of these printers print any different size other than 4×6? Is it possible to crop and edit in either printer? For glossy photos, the cost works out to just 25.3 cents each, based on the $37.99 (direct) price for a print pack with enough ink and paper for 150 photos. For matte photos, the cost is 32.3 cents per photo, based on a $32.29 (direct) price for enough ink and paper for 100 photos. The cost for other current small-format photo printers we’ve tested ranges from 27.8 cents to 32 cents for a glossy photo. Kerri – I just got the PictureMate for Christmas and was wondering if you had any additional “tips” after using it for a year. Can someone tell me what the difference is between the Matte & Glossy paper for the Epson Picturemate, other than the cost. How glossy are we talking? Any way to get a picture comparison? Hello, I am not getting good printing quality on my images using my PictureMate (the colors don’t match what I see on my screen). I am printing from Photoshop. Make sure that you let Photoshop control the Color Handling for your printing rather than the printer. There are also Printing Profiles that you can choose to match your printer as well. That’s usually what I do for the best result. select the printer to manage the color not the photoshop.. .